This article is about the skin treatment. For the band "Bodylotion", see Neophyte (band). For other uses, see Lotion (disambiguation). A lotion is a low-viscosity topical preparation intended for application to the skin. By contrast, creams and gels have higher viscosity, typically due to lower water content. Lotions are applied to external skin with bare hands, a brush, a clean cloth, or cotton wool. While a lotion may be used as a medicine delivery system, many lotions, especially hand lotions and body lotions are meant instead to simply smooth, moisturize, soften and perhaps perfume the skin. Some skincare products, such as sunscreen and moisturizer, may be available in multiple formats, such as lotions, gels, creams, or sprays. Calamine lotion is used to treat itching. Dermatologists can prescribe lotions to treat or prevent skin diseases. It is not unusual for the same drug ingredient to be formulated into a lotion, cream and ointment. Creams are the most convenient of the three but are inappropriate for application to regions of hairy skin such as the scalp, while a lotion is less viscous and may be readily applied to these areas (many medicated shampoos are in fact lotions). Historically, lotions also had an advantage in that they may be spread thinly compared to a cream or ointment and may economically cover a large area of skin, but product research has steadily eroded this distinction. Non-comedogenic lotions are recommended for use on acne prone skin. Since health care workers must wash their hands frequently to prevent disease transmission, hospital-grade lotion is recommended to prevent skin dermatitis caused by frequent exposure to cleaning agents in the soap. A 2006 study found that application of hospital-grade lotion after hand washing significantly reduced skin roughness and dryness. Care must be taken not to use consumer lotions in a hospital environment, as the perfumes and allergens may be a danger to those who are immunodeficient. Most cosmetic lotions are moisturizing lotions, although other forms, such as tanning lotion, also exist. Cosmetic lotions may be marketed as anti-aging lotions, which can also be classified as a cosmetic in many cases, and may contain fragrances. The Food and Drug Administration voiced concern about lotions not classified as drugs that advertise anti-aging or anti-wrinkle properties. Most lotions are oil-in-water emulsions using a substance such as cetearyl alcohol to keep the emulsion together, but water-in-oil lotions are also formulated. The key components of a skin care lotion, cream or gel emulsion (that is mixtures of oil and water) are the aqueous and oily phases, an emulgent to prevent separation of these two phases, and, if used, the drug substance or substances. A wide variety of other ingredients such as fragrances, glycerol, petroleum jelly, dyes, preservatives, proteins and stabilizing agents are commonly added to lotions. 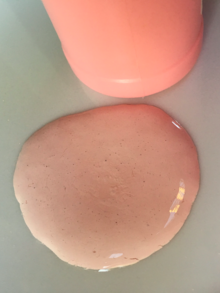 Since thickness and consistency are key factors in lotions and creams, it is important to understand the manufacturing process that determines viscosity. Emollients and lubricants are dispersed in oil with blending and thickening agents. Perfume, color and preservatives are dispersed in the water cycle. Active ingredients are broken up in both cycles depending on the raw materials involved and the desired properties of the lotion or cream. Step 1: Add flake/powder ingredients to the oil being used to prepare the oil phase. Step 2: Disperse active ingredients. Step 3: Prepare the water phase containing emulsifiers and stabilizers. Careful note should be taken in choosing the right mixing equipment for lotion manufacturing to avoid agglomerates and long processing times. It can make all the difference in manufacturing time and costs. Conventional agitators can present a number of problems including agglomerates and longer processing times. On the other hand, high shear in-line mixers can produce quality lotions and creams without many of the complications encountered with conventional mixers. Sonolation is also a process that is growing in popularity. Depending on their composition, lotions can be comedogenic, meaning that they can result in the increased formation of comedones (clogged hair follicles). People who are prone to acne or forming comedones often prefer lotions that are designed to be non-comedogenic (not causing outbreaks). All topical products, including lotions, can result in the percutaneous (through the skin) absorption of their ingredients. Though this has some use as a route of drug administration, it more commonly results in unintended side effects. For example, medicated lotions such as diprolene are often used with the intention of exerting only local effects, but absorption of the drug through the skin can occur to a small degree, resulting in systemic side effects such as hyperglycemia and glycosuria. Absorption through the skin is increased when lotions are applied and then covered with an occlusive layer, when they are applied to large areas of the body, or when they are applied to damaged or broken skin. There is currently no regulation over use of the term "hypoallergenic", and even pediatric skin products with the label were found to still contain allergens. Those with eczema are especially vulnerable to an allergic reaction with lotion, as their compromised skin barrier allows preservatives to bind with and activate immune cells. The American Academy of Allergy, Asthma, and Immunology warns that natural lotion containing ingredients commonly found in food (such as goats milk, cow's milk, coconut milk, or oil) may introduce new allergies, and an allergic reaction when those foods are later consumed. ^ a b Remington, Joseph Price (2006), Beringer, Paul (ed. ), Remington: The Science And Practice Of Pharmacy (21st ed. ), Lippincott Williams & Wilkins, p. 772, ISBN 978-0781746731. ^ McDonald, Michel (July 2009). "What's The Difference Between An Ointment, A Cream And A Lotion?". ABC News. Retrieved 2 January 2016. 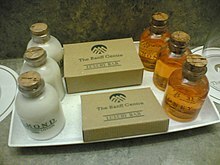 ^ "Soaps & Lotions". U.S. Food and Drug Administration. Retrieved 2 January 2016. ^ "Hand Dermatitis in Health Care Workers" (PDF). Washington State Department of Labor and Industries. Retrieved 31 December 2015. ^ Kampf, G.; Ennen, J. (2006). "Regular use of a hand cream can attenuate skin dryness and roughness caused by frequent hand washing". BMC Dermatology. 6: 1. doi:10.1186/1471-5945-6-1. PMC 1397860. PMID 16476166. ^ a b "Fragrances in Cosmetics". U.S. Food and Drug Administration. Retrieved 2 January 2016. ^ Thompson, Kirsten M.; Littau, Cheryl A. "Keep consumer hand lotions at home". American Nurse Today. Retrieved 31 December 2015. ^ "Wrinkle Treatments and Other Anti-aging Products". U.S. Food and Drug Administration. Retrieved 2 January 2016. ^ a b Sibbald, Debra (October 2016). "Acne". RxTx. Ottawa, ON: Canadian Pharmacists Association. Retrieved April 25, 2017. ^ a b "Betamethasone (Topical)". Lexicomp Online. Hudson, OH: Lexi-Comp, Inc. April 21, 2017. Retrieved April 25, 2017. ^ Parsons, Julia. "Protect children's skin from unregulated term 'hypoallergenic'". BAYLOR COLLEGE OF MEDICINE NEWS. Retrieved 31 December 2015. ^ Schlichte, Megan J.; Katta, Rajani (2014). "Methylisothiazolinone: An Emergent Allergen in Common Pediatric Skin Care Products". Dermatology Research and Practice. 2014: 1–4. doi:10.1155/2014/132564. PMC 4197884. PMID 25342949. Retrieved 31 December 2015. ^ Doyle, Kathryn (2013-12-12). "Some skin creams bad news for eczema". Reuters. Retrieved 31 December 2015. ^ Graham, Melissa. "Researchers find link between natural lotions, new food allergies". American Academy of Allergy, Asthma & Immunology. Retrieved 31 December 2015.